If you want to be good at anything, you need to practise. It’s the same with scuba diving. All the skills you first learn in the pool, and later in open water, need to be practised until you just do them without even thinking about it. Accomplished divers – and you can easily become one of them – have no problem with taking their regulators out of their mouths and replacing them. They can clear water that may have found its way into their masks, clear their ears when they need to and adjust their buoyancy. It is second nature for them to manage their air supplies, know how deep they are and control their ascent. You will soon be able to do these things without giving them a second thought. Once you are well practised, you can manage yourself underwater as easily and confidently as you walk down the street! 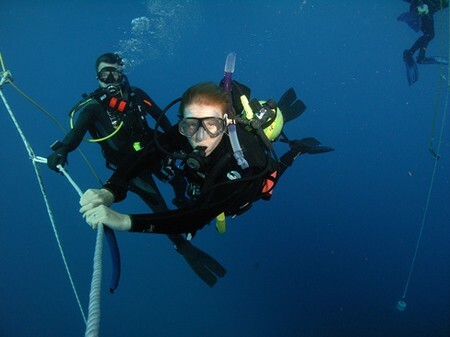 The only way to improve your skills and gain confidence is to go diving regularly. If you live far from the ocean, membership in a diving club will allow you to use a swimming pool for scuba diving on a regular basis. You can repeat your diving practice using all your equipment until your skills are honed to perfection. The first step is to manage your expectations. Once you have done that, your confidence will grow. For example, you may expect diving to be a claustrophobic experience, but then find yourself awed by the wide-open spaces encountered in the world below the ocean. You may want to cling to your regulator in the mistaken belief that water will flood into your mouth when you take it out, but then be happy to find it does not. You’ll soon gain the confidence to exhale in the knowledge that your regulator is always ready with another breath. You may think that you will need to depend on others when you are diving, when in fact you will become the one that others can depend on. A good exercise for improving confidence is to practise taking off your equipment in the pool and then replacing it. This will help you get to know where everything is. It’s also good to take off your mask and swim around without it to build confidence. Swimming blind with a mask blacked out with duct tape will give you the confidence to swim in conditions where visibility is poor. Going through your rescue skills and repeating them is essential practice. You never know when you may need them. Just spend time underwater to get used to the weightless conditions found there. Once you are able to manage yourself underwater, you can get on with enjoying being down there. Then, you can have fun looking at the marine life and even taking some photographs. Once you are confident in your ability to conduct yourself underwater, you will be able to be more adventurous. One thrill of diving is getting close to the bigger undersea creatures. At first this may seem scary but these sea animals won’t have any idea what you are and will only let you get so close before beating a hasty retreat. Eventually, you will find yourself doing things that your non-diving friends simply won’t believe. You’ll need to bring back plenty of photographs of yourself simply to ensure that they don’t think you’ve become a fantasist! How To Become a Member of Library of Congress with an ID?